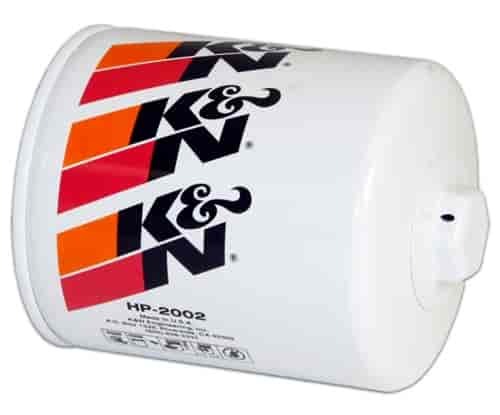 Does K&N HP-2002 fit your vehicle? HP-2002 - K&N HP Series Performance Gold Oil Filters is rated 5.0 out of 5 by 4. Rated 5 out of 5 by 1936 Chevy from The best I only use K&N filters on my race engines, Period! Rated 5 out of 5 by comp 358 from highest quality and construction we have found Have tried them all and K&N is the best quality, cheap filters can cause catastrophic engine failure with the oiling system when they collapse internally or blow out. Only filter we know with a hex head for ease of installation. will this fit on my 1987 montecarlo with a 502 engine? This should fit the 502 engine, please check the fitment on your application when mounting. Outside Diameter 3.688 in (94 mm) is that the filter walls or the rubber gasket? That is the OD of the filter housing.